Hey, hey, hey, Mitakihara Town and Mitakihara University! ¡Viva La Familia Magia! This is Gir Todafunk, Mr. 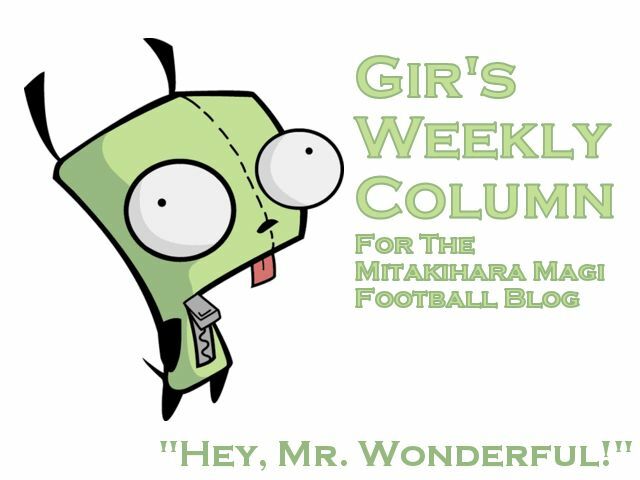 Wonderful himself, back with another Weekly Column for the Magi Football Blog and the Daily Magi. I'm in awesome mood today, you know why? MY FIRST NATIONAL PLAYER OF THE WEEK HONOR! WOOO HOOO! Awwwww yeah, I'm feeling the love from ESPN and TSN and everybody in the press. You love me! You really love me degeso! Yeeeeey! All right, all right, I'm deactivate my fanboy switch right now. Click. So anyway, it feels so awesome to finally be named NCAA Player of the Week for my 10 tackles and three interceptions and six pass deflections. So what if Pierre Horton set the record for most receiving yards in a game? Hawai'i still got crushed doe! But still, that Horton guy was good. I had difficulty eying on that dude when he was on the field. I got a few turnovers, but I could have done better without giving up that record. Hawai'i was throwing like there was no tomorrow, so credit to them for lighting it up through the air. Of course, we can do the same, and Haru the Pig threw for over 1,000 yards. Oh yes, and we dumped 255 on them. In typical Mitakihara fashion. Remember, members of the Family, we do our best to be awesome. It's our duty. So, here I am at the Quality Inn & Suites, Laramie. This is a cowboy town. Of course, because Wyoming's teams are called the Cowboys and Cowgirls. Just thinking about Wyoming's women makes me imagine Nana in a cowgirl outfit with daisy dukes and hat. And I take her shorts off and she rides with me into the sunset. Oooooh, I lick my lips just thinking about me. I love Nana. She means everything to me. I've been investigating this novel dish called Rocky Mountain Oysters. These are calf testicles that are peeled, coated in flour, pepper and salt, pounded flat and deep-fried. They also go by such dodgy handles as "bull's eggs," "criadillas," "huevos de toro," "cowboy caviar," "Montana tendergroins," "dusted nuts," "bull fries," "swinging beef," "What God Hath Wrought..." All right, I made that last part up. But the point is this: these things are pretty good. The best place to find these Rocky Mountain Oysters is the Cavalryman Supper Club, 4425 S. 3rd St. Laramie, WY 82070, (307) 745-5551. They also have great prime rib, king crab legs and some delectable center cut bison. Yes, buffalo is farmed and served here because it's Wyoming, duh. Wyoming is full of Republicans and carnivores and carnivore-crazy Republicans looking to feast on a Democratic jackass or two. Yes, it's that real. The whole team had their welcome dinner at the Supper Club this week, organized by the local Wyoming USA chapter of the Men About Town. People here are friendly and laid back. Well, they have every reason to be because Wyoming's football team is not that good. They are enjoying their basketball team, though. Women's that is. Last year, the Cowgirls edged the Puella Magi in the Mountain West Championship game, and Madoka ended up winning the Women's NIT. First ever. Hopefully, the ladies get their act cleaned up this season. Pretty short column from me today. Next week, I salute Haru The Pig, Jeff Nakazawa, Takumu, and the rest of the seniors in the Magia Day game. Do look forward to the next column, readers. I'm Gir Todafunk, Mr. Wonderful, signing off. You are not alone.